Concerning the shipbuilding aspect of Brodosplit, there are currently 18 on-going construction projects for new vessels. One is for equipping a cruise liner 105 m long with accommodation for 150 passengers and 69 crew. In addition, the construction of the first of a series of five identical 64-metre long sailing vessels is currently underway, each of which can accommodate 36 passengers and 9 crew. Furthermore, the largest sailing vessel in the world is being constructed, as well as the first in a series of five identical patrol vessels for the Ministry of Defence of Croatia – 43.50 meters long and an 8-meter beam, four vessels for container transport and two for nautical tourism for local clients from Split. “In addition to shipbuilding we also develop and provide a wide range of products with over 30,000 tonnes of contracted steel constructions such as the 63 steel gates to protect Venice from flooding. The project is financially highly positive, yet also challenging and employs almost half the workforce over a period of 21/2 years”, emphasised Tomislav Debeljak, President of the Management Board of Brodosplit. Over 31/2 years have elapsed since the start of the restructuring process of Brodosplit and according to Debeljak everything is being performed according to plan. “During the period in which Brodosplit was privatised, the contribution of the company to the restructuring – including recapitalization, commercial sources and own financial reserves – was €0.23 billion”, stressed Debeljak. According to information provided by Brodosplit, Shipbuilding Industry Split has implemented the operational plan and ended the third quarter showing a consolidated profit. “These results do not include restructuring subsidies that other shipyards include in their figures, as well as in the profit and loss account and hence operational sustainability is currently already achieved even without subsidies. Business operations have been showing continuous growth trends both concerning total volumes and exports. We can express our utmost satisfaction with the results achieved thus far. Brodosplit employs over 2,000 people, it has ensured full employment until 2019 and continuously focuses on new commercial projects primarily concerning contracted work whose bid adjustments are positive”, explained Debeljak. 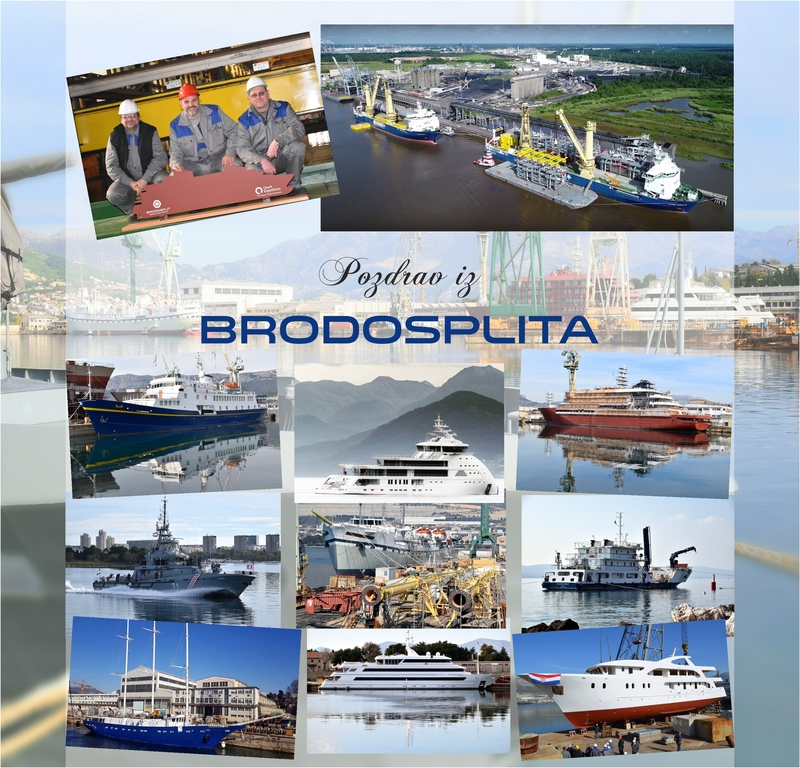 The competitive advantage and specific feature of Brodosplit, according to Debeljak, is that it is involved in the construction of extremely technically and technologically demanding vessels with higher value added and with luxury interior designs. As a good example of this, he pointed out the construction of the largest square rigged vessel globally, where Brodosplit has been identified as one of the few shipyards in the world with the potential to construct such a unique vessel, and offers for the construction of luxury motor yachts unprecedented in Croatia thus far. “Our specific objectives are the positioning of Brodosplit on the market for the construction of more complex vessels and large constructions such as cruise liners, passenger ships, the gates for the protection of Venice, military vessels and yachts, amongst others. Moreover, we will be insisting on the implementation of alterations throughout the business processes in order to boost productivity and performance effectiveness. Profitable contracts are imperative in order to ensure a positive future. We are expecting the implementation of contracts entered into through competitive bidding for the construction of vessels and large steel constructions”, stated Debeljak. Brodosplit has recently entered into a contract for the construction of a 108-meter long vessel, a Polar Expedition Cruise Vessel. The contract was signed in Holland with a leading company for cruising in polar regions. “Through the signing of this contract, Brodosplit is making steady progress in the implementation of its business plans and establishing its position as an inevitable European shipbuilding system involved in the construction of highly complex vessels through which it achieves a high level of competitiveness”, concluded Debeljak. According to data released by the Croatian Shipbuilding Corporation the current circumstances on the global shipbuilding market are extremely difficult. The market is facing an extreme downward trend in demand for all vessel sizes and types, with the exception of cruise liners and passenger vessels, which has seen substantial growth. Due to a significant drop in the number of contracts throughout all the shipbuilding market, with the exception of the passenger segment, many shipbuilding countries are currently facing serious problems. The South Korean shipbuilding industry has seen losses exceeding $5 billion, the Japanese shipyard Kawasaki Heavy Industries is considering closing and the Chinese shipyards are going bankrupt daily. Of the 321 contracts for the construction of vessels, China has signed 156 and ranks first according to the quantity of CGT with 3.2 million CGT, whilst Italy ranks first according to the value of contracts for the construction of vessels, at $5.3 billion. The largest slump in the number of construction contracts was for LPG tankers, down 91% in relation to the same period last year, followed by a significant drop of 86% in the number of contracts for bulk carriers, crude oil tankers were down 84%, general cargo vessels decreased by 81% and refrigerated cargo vessels were down 78%. Furthermore, contracts for the construction of other types of vessels saw a decrease ranging from 55% to 76%, with the exception of passengers and cruise liners, which rose by 70%. 2016 saw 51 for the latter type of vessels. During the first nine months of 2016, the percentage of contract passenger ships (in CGT) in the total quantity of those contracted was 26%, with bulk carriers accounting for 18%, crude oil tankers 17%, container vessels 14%, and offshore vessels accounted for only 5%. According to data on the World Shipbuilding Order Book measured in deadweight tonnage, China is still the leading country at over 44% of the Order Book, followed by South Korea and Japan accounts for around 24%. The overall European shipbuilding industry currently still accounts for around 1.9% of the World Shipbuilding Order Book, with Croatia ranking 9th with a share of about 0.3%. At the European level, Croatia still ranks 2nd with around 16.8% of orders. Croatian shipyards rank second following Romania according to the value of orders placed. Next Next post: Krepat, ma ne molat!